Note 12/18: this is real. I’ve not written much before about this rumor, but if it is true, there’s a chance it will be announced before or as part of tomorrow’s Q4 and FY2017 earnings call, so I thought I’d put in a bit of context and speculation about impact in advance of that. 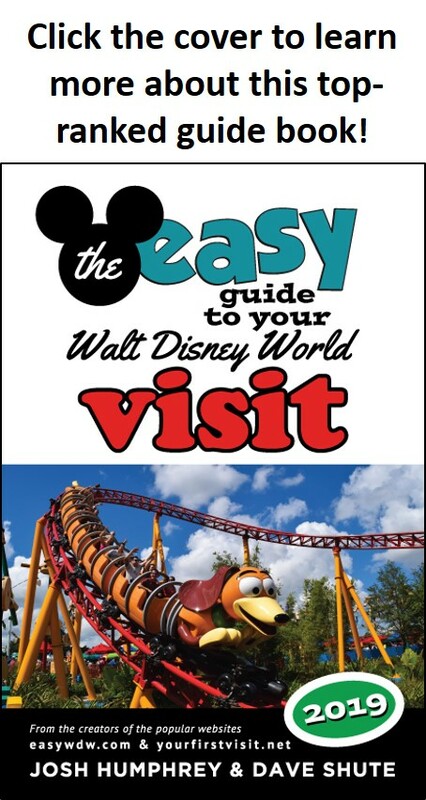 Disney’s FastPass+ system, fully implemented in 2014, allows you to avoid waits by pre-booking what are essentially appointments at up to three rides per day. So far, anyone with a ticket could begin booking their FastPass+ 30 days before use, and those staying in a Disney-owned hotel or the Swan or Dolphin could begin booking 60 days ahead. While there’s actually been pretty good availability for most rides at 30 days ahead, those with 60 day rights have a much better chance of getting a FastPass+ for the hottest rides (currently Flight of Passage and Seven Dwarfs Mine Train) and generally have more flexibility in booking their FastPass+ on the days and times that best suit their other Disney World plans. Those in the Disney Springs Resort Area, which Tom says should “all” get 60 days FastPass+: seven hotels with around 3,700 rooms. The WDW Good Neighbor hotels, which are scattered all over the place to the south and west of the Convention Center, but are largely concentrated in the Palm Parkway and US 192 areas (although you’ll also find them near the Convention Center, in Flamingo Crossing and on Chelonia Parkway, just to the east of Pop Century): 52 hotels with around 17,000* rooms. Shades of Green and the Four Seasons, both nearer the core of Disney World than any Disney Springs or Good Neighbor hotel (except maybe for those on Chelonia Parkway), but not part of either of the above two groups. Two hotels with about a thousand rooms between them. 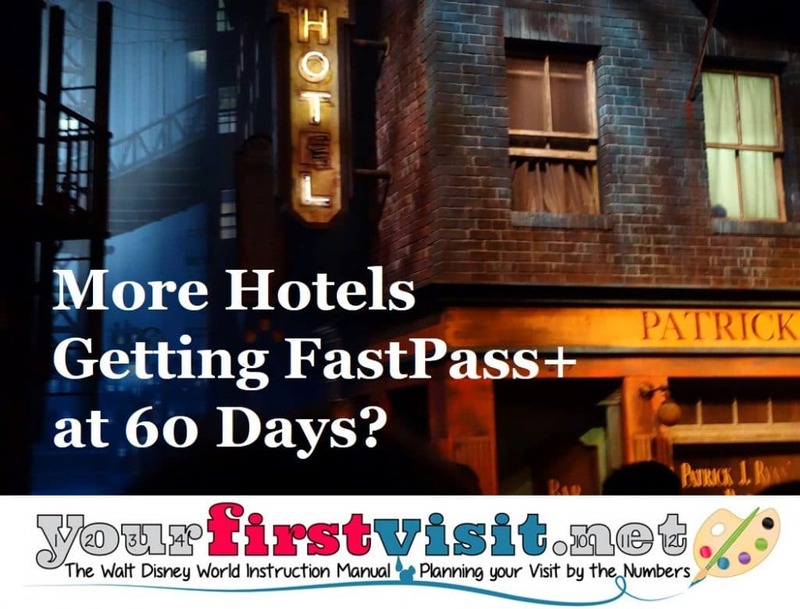 If this happens, its impact is profoundly shaped by how many Good Neighbor rooms gain access to FastPass+ at 60 days—and where they are located. If only the Disney Springs Resort Area hotels and one or the other of Shades and Four Seasons gets 60 day access, then I don’t expect much impact, as the number of eligible rooms would go up only 15% and lower occupancy at the Disney Springs hotels (compared to the Disney owned hotels) would reduce the impact even more. If these hotels plus all the Good Neighbor hotels get access, then a total of around 21,000 rooms would be added to the FastPass+ at 60 days pool. Correcting this for lower occupancy, and also for the fact that many of the guests of these hotels are in them for reasons other than Disney World (conventions, Universal), the effective total increase is likely on the order of 10,000 rooms, or about a 36% increase. This would make the hottest rides even harder to book, even at 60 days, and would pull more capacity out of the FastPass+ system for those who can only book at thirty days. But, if this happens, I don’t expect all the Good Neighbor hotels to be in it—as I would expect Disney to be charging them for it, and not all of them would find the extra cost to make business sense. I can think of two reasons why Disney might do this, and of course some reasons why it might not. Expanding beyond the Disney Springs Resort Area hotels into some or all of the Good Neighbor Hotels (and/or Shades and Four Seasons), if done for a fee charged them by Disney, is a way for Disney to additionally monetize what Disney is likely to view as extremely high incremental hotel stays related to its 2018 Toy Story, 2019 Star Wars and other later Disney World expansions. Disney World does not have enough capacity in its own hotels (which average nearly 90% occupancy) to serve these incremental guests, and while a couple of additions/expansions are planned/underway, these will also not be sufficient nor even all that timely. Even more Disney hotels are possible—likely, even—but not in any reasonable timeframe. Moreover, new hotels absorb capital and impose operating risks, which are avoided by monetizing someone else’s capital and operations (this is essentially the logic of DVC, except that Disney fronts the capital which is then bought down by DVC owners). So expanding access to FastPass+ at 60 days, but charging hotels offering it for the privilege of doing so, would add essentially costless and riskless revenue, which by my back-of-the envelope calculations could easily drop another $100 million a year to Disney World’s bottom line. But of course it would not really be costless or riskless, as it would be removing some of the value of the 60 day window at the hotels that currently offer it, diminishing the reason to stay at one of these hotels instead of one of the (typically much less expensive) other hotels newly added to the 60 day FastPass+ window. The fixed cost economics of hotels are such that Disney would lose much more income from a hotel guest who does not stay in one of its own hotels than it could possibly gain from a fee paid by the off-site hotel that that this guest actually stays in. But recall that the distinctive 60 day window is a perk that’s less than five years old. There are many other good reasons to pay the premium (which can be very high, especially at the moderates and deluxes) to stay in a Disney World hotel besides the 60 day FastPass+ access—I recommended the Disney hotels to first-timers even in the old days when all guests were treated equally in the parks, except for Extra Magic Hours. And speaking of Extra Magic Hours… The example of Animal Kingdom this summer, when Pandora was open an extra 14 hours a week to Disney World (and Shades of Green and Swan and Dolphin) hotel guests, can be replicated (and expanded, to e.g. 21 or 28 hours) at Hollywood Studios for Toy Story and Star Wars. Differential perks can be added and expanded, so that the Disney-owned hotels can continue to command their premium pricing, which we all complain about on the way to filling them.